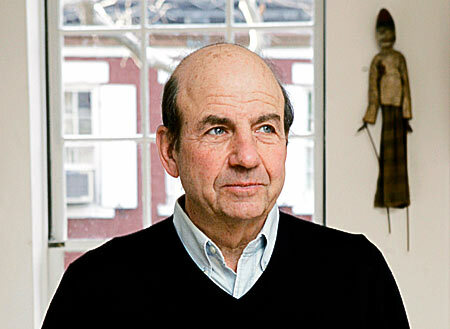 Garlic Escapes: Happy Birthday Calvin Trillin! Mr. Trillin is on of my very favorite writers. Here are two of his best-known garlic quotes. "Following the Jewish tradition, a dispenser of schmaltz (liquid chicken fat) is kept on the table to give the vampires heartburn if they get through the garlic defense." Trillian tried valiantly to get flavorless turkey replaced with Spaghetti Carbonara as our national Thanksgiving dish. This recipe is from Ruth Reichl's Garlic and Sapphires. Boil a large pot of salted water. Throw spaghetti in. Cut bacon crosswise into pieces ½ inch wide. Put bacon in skillet and cook 2 minutes, until fat begins to render. Add whole cloves of garlic and cook five minutes, until edges of bacon just begin to crisp. Do not overcook. If too crisp, the bacon won’t meld with the pasta. Break eggs into the bowl in which you will serve the pasta and beat eggs with fork. Add grindings of pepper. Remove garlic from bacon pan. It it looks like too much fat to you, discard some. But you are going to toss the bacon with most of its fat into the pasta. When cooked, drain pasta and immediately throw it into the beaten eggs. Mix thoroughly. The heat of the spaghetti will cook the eggs and turn them into a sauce. Add the bacon with its fat; toss again; add cheese and serve.